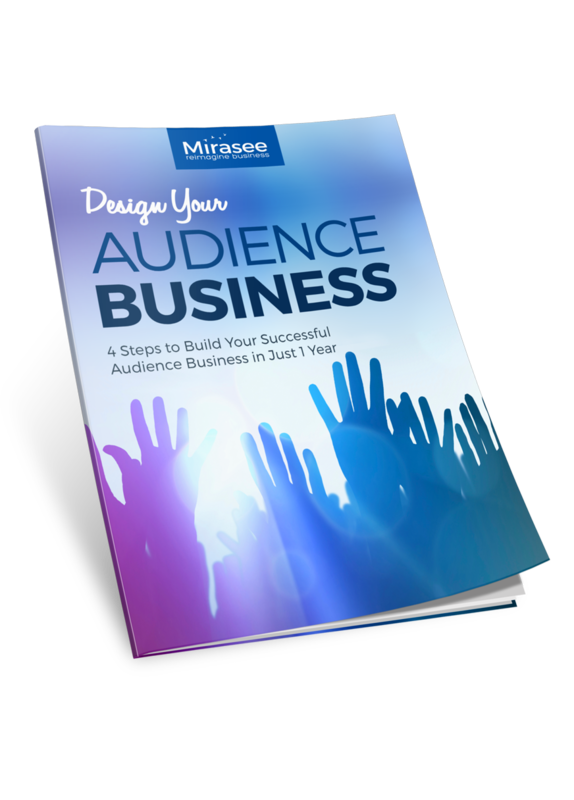 It’s a whole lot easier to promote your business if you don’t have to do it alone. Sure, you could advertise, but people pay less attention to ads than they used to – and they don’t trust them that much, either. Recent research from Nielsen reveals that 83% of people believe recommendations from friends and family. If you get people who love your products and services to recommend you to the people who trust them, marketing your business gets a whole lot easier. The results are better, too. And if those fans also happen to have huge audiences of their own, you’re onto a winner. So where do you find these fans and influencers? 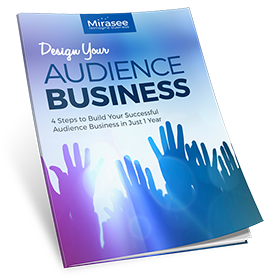 With its huge audience, social media is a great starting point. There are a couple of tools that, used together, help you find the people you need on your outreach list. They are Buzzsumo and Klear. 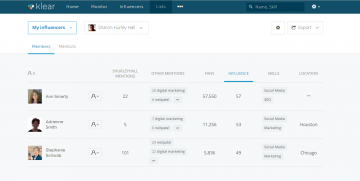 Buzzsumo’s dual mission is to analyze top performing content and to identify influencers. And you need both to build your outreach list. 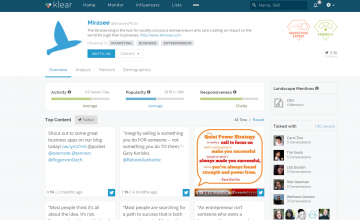 To get started, sign in to Buzzsumo and navigate to the “most shared” tab. 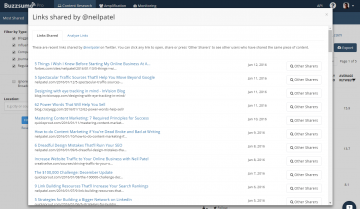 The main Buzzsumo screen has a search box, into which you can type a topic or domain. 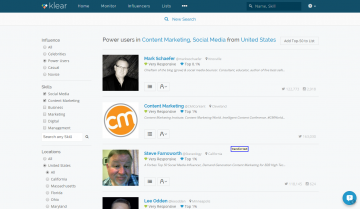 Advanced search features allow you to find content by author, Twitter user, domain and more. You can even search by topic within a particular domain. 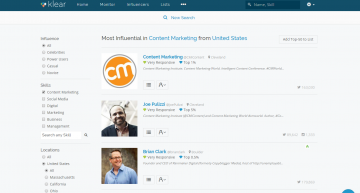 Fine tune your results and discover who is sharing what type of content with the filters on the left of the screen. You can choose a publication period between a day and a year, select a country via TLD, choose a language, and refine results according to whether they are articles, infographics, guest posts, giveaways, interviews or videos. Let’s start by typing quicksprout.com into the search box. By default you get a list of the most shared content from the searched site. 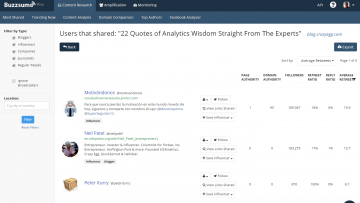 The free Buzzsumo account lets you see the first few results, but you can see all the results with a pro account. Refine your search to focus on particular types of content (articles and infographics in this case) and limit the search period so you can see who’s been interested in this content recently. Once you make your selection, press the “filter” button. Alternatively, you can keep the search period broad so you can see who is consistently interested in and sharing content of a particular type. With a Pro subscription, you can click on “view sharers” next to an article title and see who has shared the content. Here you’ll also see domain and page authority, follower numbers, and retweet and reply ratio for the sharers so you can gauge activity level. Follow that up by clicking on “view links shared” to see what else that person has shared. It’s a good way to understand what kind of content interests that person and whether they would be a good fit for your outreach list. It’s also worth looking at the labels below the name of each sharer. With this you learn whether the person is a blogger, influencer, company, journalist, or a regular person. Once you think the person is a good fit, click the “save influencer” button to add them to a list. Even if you’re using the free version of Buzzsumo, you can still start to build your outreach list. Click the “Twitter influencers” tab, then search by Twitter handle, topic, or keyword to see who has been sharing content. Again, apply filters to see only those who are most relevant to you. 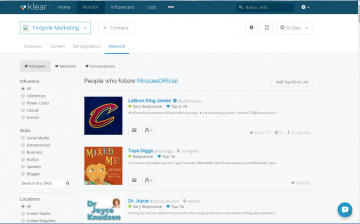 Buzzsumo’s great for starting your outreach list, but if you want to get even more insight into the network you’re building, try pairing it with Klear (formerly Twtrland). This free tool allows you to create a social media profile by linking your Twitter, Facebook and Instagram account. The profiles include information on social rank, fan base and fan base growth, as well as content analysis, demographic information and follower analysis. 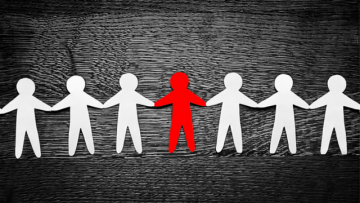 A good way to use Klear is to check out the profiles of the people you have included on your outreach list. 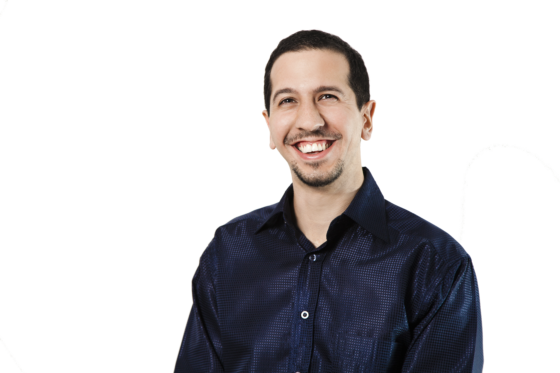 With a pro account you can refine your network by skills (such as social media, entrepreneur, business) and exclude brands and users who are inactive, unpopular or unresponsive. With the pro account, choose whether to make your search broad or narrow and exclude people who are not active on Instagram. Change your filters to get different results, ensuring your outreach list contains only the people most relevant to your goals. 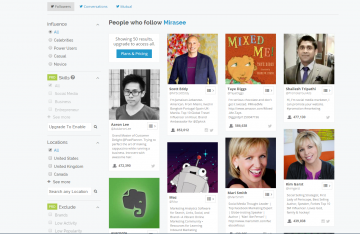 Like Buzzsumo, use your research on Klear to build an influencer list (which includes broad stats on each person), and then connect with the people you want to reach on Twitter and search for them on LinkedIn. With Klear, you can refine your outreach list according to relevance and amplification potential. For example, Purematter used the platform to connect with 20 influential bloggers and create authentic content which resulted in a 65% conversion rate. You can also use Klear to monitor users so you can respond. While there are other tools that also do this, it is handy to have everything in one dashboard. These two tools work very well to help you create an outreach list. At the end of this process you’ll be more connected with a group of people who love your stuff and are willing to share. Have you used these tools? Share your top tips below. 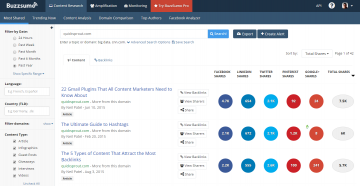 I’ve been using Buzzsumo and it works really great. But I have not tried Klear yet. I wonder, what is their biggest difference?